You’ve been waking up every morning with mysterious bites. It’s confusing, irritating, and a little bit gross, right? It’s the dreaded diagnosis of bedbugs. What action you take now makes all the difference in whether you continue to struggle with an infestation, or resolve the issue very easily. Go through the options: You could dispose of the mattress (and perhaps the bed in a worst case scenario), or you could pay an expert to attend and professionally remove the bugs. But, these are quite costly and in some cases would be considered overkill. Instead of doing all that, let’s concentrate on finding a cheaper and just as effective solution. 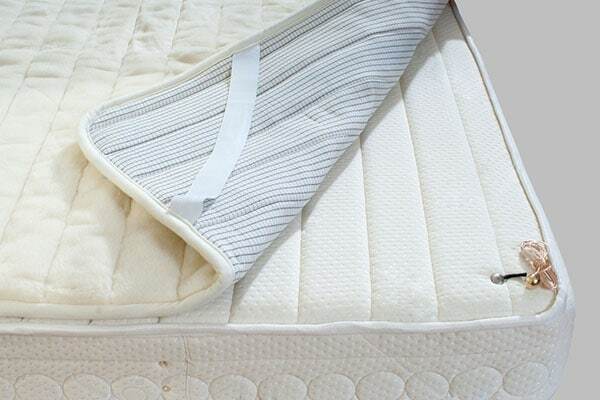 Choosing the best bed bug mattress cover will achieve excellent results at a very low cost. It will protect you from nasty bites and prevent you from losing the expensive mattress that you have grown to love. With that in mind, let’s take a look at some of the most effective on the market right now. We discuss which properties to look for in particular, and then review the top 5. If you already have bed bugs, the best solution is to utilize a bed bug mattress cover. This will encase an infested mattress and force bedbugs trapped inside to starve. If the encasing works correctly, you shouldn’t have to dispose of the mattress. There are other options, but an encasement is certainly the cheapest and easiest method of removing bed bugs. If you don’t have an infestation, but know that other households in the area have suffered, a mattress encasement prevents bed bugs from getting into the mattress in the first place. You’ll have to cover both the mattress and the box spring. If an infestation already exists, experts sometimes recommend covering any pillows as well. To treat bed bugs without using any chemicals, you’ll have to commit to having the mattress encased for at least a year if not more. Bed bugs have been shown to go as much as a year without a meal under certain conditions, so this isn’t a few months of commitment. You may also have to inspect the bed frame and box spring as well just to be on the safe side. The holes in the wood can harbor bed bug eggs and nests. There’s no need to take the whole thing apart and check. They cannot fly, so add some sticky traps to catch any that try to climb up the bed frame and make sure any bedding does not drag on the ground. Pull the bed away from the wall, too. How Do I Choose The Right Mattress Cover? Many covers claim to protect against infestations and prevent new outbreaks. If you want the best bed bug mattress cover, there are a few things you need to make sure of. If the cover doesn’t encase the mattress, it isn’t 100% going to protect you. Some covers advertise as bed bug proof, but they don’t cover the whole mattress. There are places around the zippers and seams where bugs can still escape and spread. You need a cover that wraps the mattress completely. It should be sealed around the seams to prevent tears and holes, and also have protection around the zipper area for both sealing and avoiding accidental openings. The material should be waterproof but contain microscopic openings so that air can move through it. These holes won’t allow bugs to escape but will ensure a more comfortable night’s sleep, and also prevent shortening of the mattress life expectancy. Don’t think you have to use vinyl to seal against bed bugs. Vinyl doesn’t breathe or provide aeration for your skin while asleep. Just because it’s a vinyl cover, it doesn’t mean it’s properly sealed or that it will protect against bugs. If you were planning to treat the mattress with bed bug treatments or sprays, you might want to use a cover instead. A cover will prevent your skin from coming into contact with the chemicals used in the procedure. Choosing the best bed bug mattress protector will also ensure protection against stragglers who haven’t died from the treatments. It will provide an essential barrier between you and a mattress as the procedures do their work. In the future, it can cut down on allergens and repel moisture. Liners have a terrible reputation for being uncomfortable and loud. Old liners were made of plastic or vinyl, both of which crinkled while moving during the night and trapped heat against your body. New materials include things like polyurethane and polyester. These materials have microscopic holes that allow air to flow between you and the liner but still trap microscopic organisms inside. They are quieter, sometimes silent, and let you sleep more comfortably. Many also have a cotton top layer that feels like a regular mattress. With the cotton top, the liner grips sheets more like a bare mattress so they don’t shift as you move around during the night. You won’t have to adjust your layers every morning. These materials are more eco-friendly than traditional plastics, too. They don’t use PVCs or produce the kinds of toxic off-gas that vinyl or traditional plastics will. If you have existing allergies, skin or respiratory problems, off-gassing is a serious concern, but you wouldn’t have to worry about that. Zippers and the seams around the zippers are a severe possibility for breach. If the seams are too large, bed bugs will jump out of the liner and back in. If the zippers are too large, the same thing happens. Another issue is that sometimes zippers come undone as you shift around or accidentally bump against the bed. If you don’t continually check the zipper, you could be in for a nasty surprise in the morning. Many encasements consider this when designing their zippers. They use superfine zippers with sealed seams. One good thing to look for is a flap that provides 360-degree velcro closure around the zipper once it’s in place. It offers one more barrier between the bed bugs and the outside world and prevents the zipper from opening accidentally. 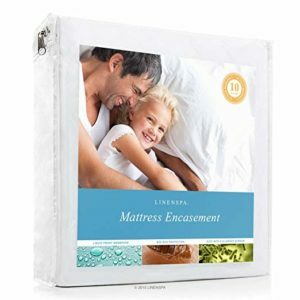 The first of our reviews is from Linenspa, a long established bedding company. This one is a zippered mattress encasement made of an inner polyurethane material with a soft, breathable polyester top. It’s ultra-thin but protects all sides of the mattress, not just the top and bottom. It’s spill-proof and moisture resistant. One of the biggest reasons that mattress encasements fail to solve a bed bug problem is that users take them off the mattress. You don’t have to remove this encasement to launder; wipe down the surface if you have a spill. Bed bugs can live for up to a year with no food, so watch out. The LINENSPA is free of vinyl and safe for kids. Polyester doesn’t irritate vinyl, but it will offer a quiet night of sleep without becoming sweaty or feeling like an old hospital bed cover. There’s absolutely no crinkling sound, and it doesn’t feel like plastic at all. The zippered closure fits mattresses up to 12 inches deep. The material around the zipper creates a moisture barrier and also helps bedbugs from squeezing through. One downside is that the zipper isn’t completely sealed with a protective flap to prevent accidental opening. If you ever did feel the need to launder the cover, it is machine washable. Wash it in cold settings and tumble dry low, nothing fancy. The good thing about this encasement is you can wipe it clean from time to time without bothering with the washing machine. Another downside is the material does add some heat to the mattress. The inner polyurethane traps body heat and sends it back. The cover relies on the polyester top to mitigate some of the body heat and restore a more natural temperature. 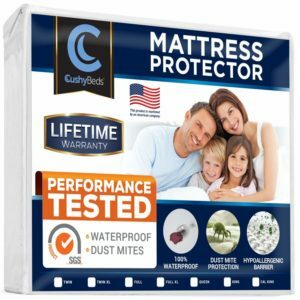 If you find yourself sweating during the night without a cover, you’ll find this one warm and may want to consider some of the alternative bed bug mattress cover reviews. 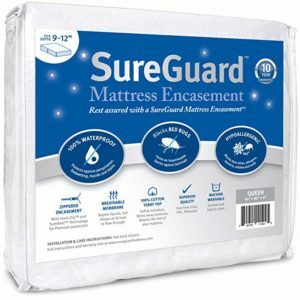 SureGuard’s encasement is a three-layered cover with a polyurethane backing, polyester covers on five sides, and cotton terry on the top. It’s breathable, more so than other protectors on the market, and doesn’t cause an increase in temperature during your sleep. 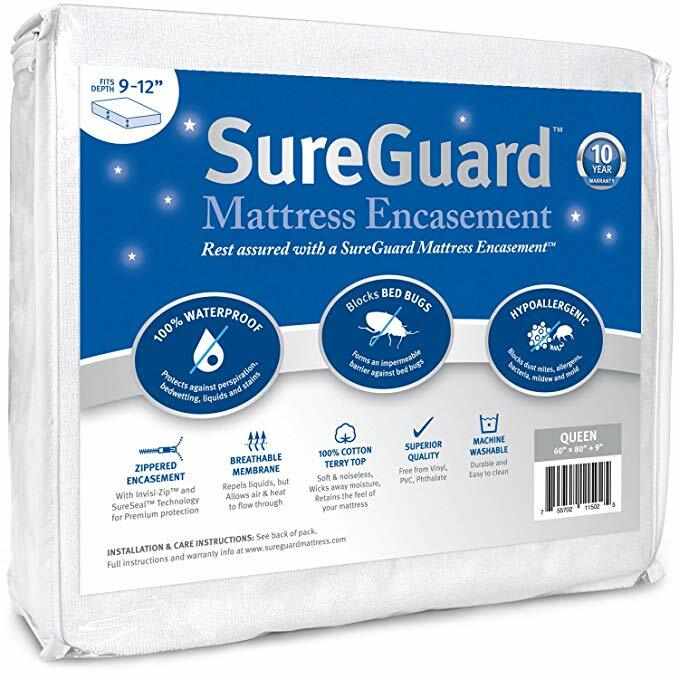 The SureGuard is entirely moisture and spill proof, so if your bed is already infested, there’s no need to remove the cover for the recommended time to kill bugs inside. Wipe things down when you need to. You can use it with memory foam mattresses as well for other types of allergen protection. The encasement works with beds up to 12 inches deep. The durable polyurethane with stretchy polyester helps prevent tears when you’re getting things set up. One of the best features of the encasement is the zipper. It’s a superfine zipper with SureGuard’s Invisi-zip and SureSeal technology. It prevents any breaches in the cover and completely seals the mattress. There is also a protective flap that folds down over the zipper head to prevent accidental openings. The cotton top provides a more comfortable sleep surface that’s quiet and doesn’t feel like plastic. The cotton grips the sheets in the same way a regular mattress would, so we didn’t notice any slippage. It does have a faint noise when you’re moving around on the bed but isn’t obnoxious. It’s free of vinyl and doesn’t have any smell. We recommend washing and drying the cover to soften the cotton top and make it more moisture resistant. Be sure to wash it in cold water and dry on low heat. High heat can damage its ability to repel moisture. The SureGuard can be tricky to put on by yourself. It’s much easier if you have a partner who can help steady the mattress as you slide the protector over. Check all the seams once the protector is in place to make sure everything is still sealed. SafeRest’s encasement is a polyurethane moisture resistant layer with a soft cotton terry top cover. It’s breathable, and the cotton helps wick moisture away from your body without allowing any to penetrate the inner layers of the mattress. The SafeRest is spill-proof, so you don’t have to remove the cover to launder. You can wipe things down with a soft cloth. If you do need to clean the encasement, simply wash the SafeRest on a cold water setting with regular household detergents (no bleach) and dry on low. One significant benefit of the encasement is the zipper. It’s ultra-fine and has a 360-degree velcro closure that wraps around the zipper to prevent accidental openings and to seal any last gaps around the zipper head. 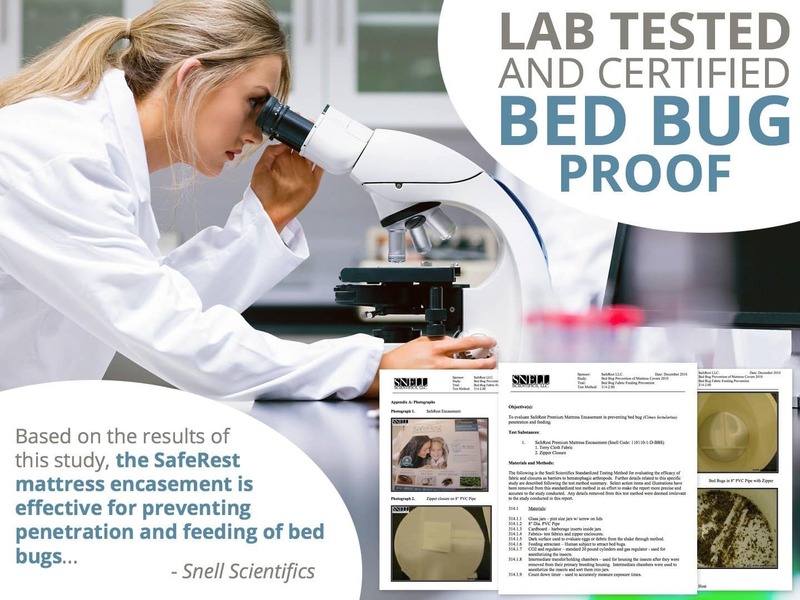 The encasement was lab explicitly tested for bed bugs and allergens. 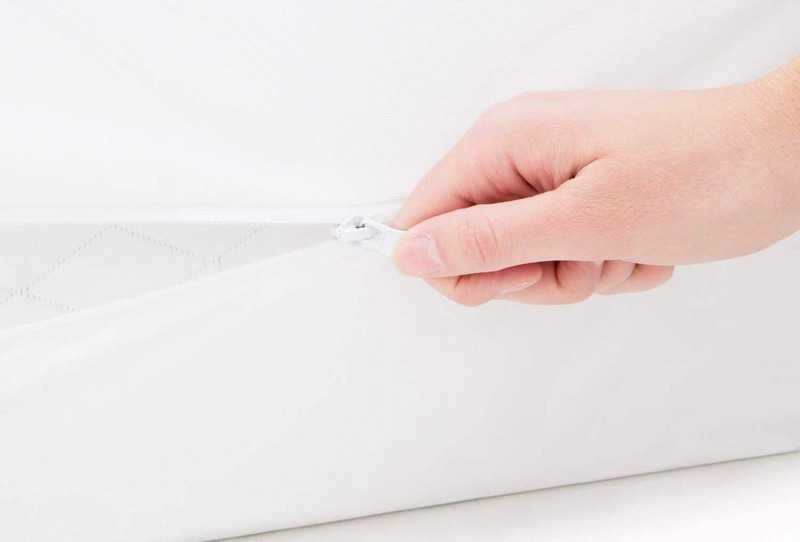 The zipper, in particular, has been certified as effective against preventing bed bugs from escaping or getting into the mattress in the first place. The noise level is nearly zero. Some mattress protectors have a plastic-like feel and sound, but this one didn’t feel any different than a traditional mattress topper (one made for comfort). The top layer does an excellent job of keeping the heat down, but because the rest of the bed isn’t cotton, it can store heat if you tuck your sheets and blankets into the bottom and sides of the bed. One downside of the encasement is that it tends to fit a little more loosely on a standard sized mattress. While this doesn’t affect the seal at all, it is annoying to have extra fabric hanging loosely. You could tuck the extra under the bed to help tighten things up. The certifications for all stages of bed bug life are a nice touch, plus the allergen-proof fabric. Also, the material seems more durable without adding too much noise or feeling like plastic. 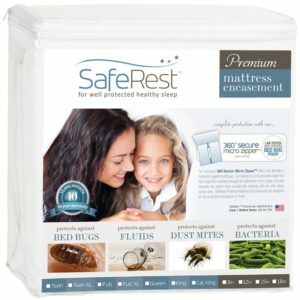 Possibly the best bed bug mattress encasement in this lineup so far, the SafeRest doesn’t fail to impress. Eco Living Friendly’s protector is an encasement that contains no toxic off-gas, PVC, or chemical post-treatments. It provides total protection from bed bugs, dust mites, and other allergens, and has an OekoTex 100 class 1 certificate, meaning the production and materials are environmentally friendly. The material uses German engineering for filtration of 1 micron, a barrier system that allows air through, so the fabric will breathe, but bed bugs cannot get into the mattress or out. It absorbs up to 400% of its weight in moisture, making it suitable for wicking sweat away from your body. It dries quickly and doesn’t need to be washed. If you do need to clean it, it’s okay to launder with ordinary household detergent and dry on low. The manufacturer recommends cleaning the ELF once before use to soften up the fabric. It’s bleach safe and maintains performance even after being washed. If you mess up and clean it on hot, it won’t strip the seal either, as it’s made to withstand some wear and tear in the laundry. One potential downside is that the zippers don’t have a cover to prevent opening and closing accidentally. If you don’t move around a lot while you’re sleeping, it might not matter that much, but be sure to check the zipper regularly. As a bonus, the material helps regulate temperature. It doesn’t get as hot as other types of mattress covers because microfilaments create a breathable layer. It doesn’t cause a lot of noise, and grips sheets a lot like a bare mattress would so you aren’t adjusting your top sheet. If you don’t need full-scale protection, an anti-bed bug mattress encasement might be a good choice. Encasements can be tricky to get on the bed and are a nuclear option for a full-blown infestation. 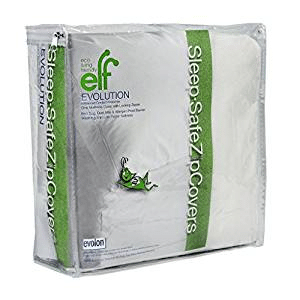 If you’ve treated your mattress and frame already, and need a layer of protection for any outliers, this is a good choice. It goes on the bed like a fitted sheet, so one person can put it on. It’s made of 80% cotton and 20% polyester terry cloth, making it soft and breathable with no noticeable temperature difference. It has a thick pocket that fits mattresses up to 18 inches deep. The CushyBeds Premium is 100% waterproof but doesn’t feel like plastic because of the polyurethane membrane and the terry cloth top. It has microscopic divots that allow air to pass through but blocks liquids. It traps mites, mold, and other microscopic organisms on the surface of the cover where you can safely wash them away. The manufacturer recommends washing the cover every three months or so to prevent buildup and triggering allergies. It’s washable with ordinary household detergents. Wash on cold and tumble dry low so that you don’t degrade the waterproof layer. Each time you wash it, it gets softer and more comfortable. There’s no noise, and it doesn’t feel like a plastic liner the way some waterproof liners do. One downside is that it doesn’t encase your mattress fully. If you want to get rid of bedbugs without using sprays and chemicals, this mattress cover isn’t going to do that. It can protect you against stragglers who haven’t been affected by the spray treatments, but that’s about it. If you want a simple layer between you and a previously infested mattress and prevent some of the chemicals from getting into your skin through the sheets, this is a good option. It’s simple to use and protects your mattress and you. 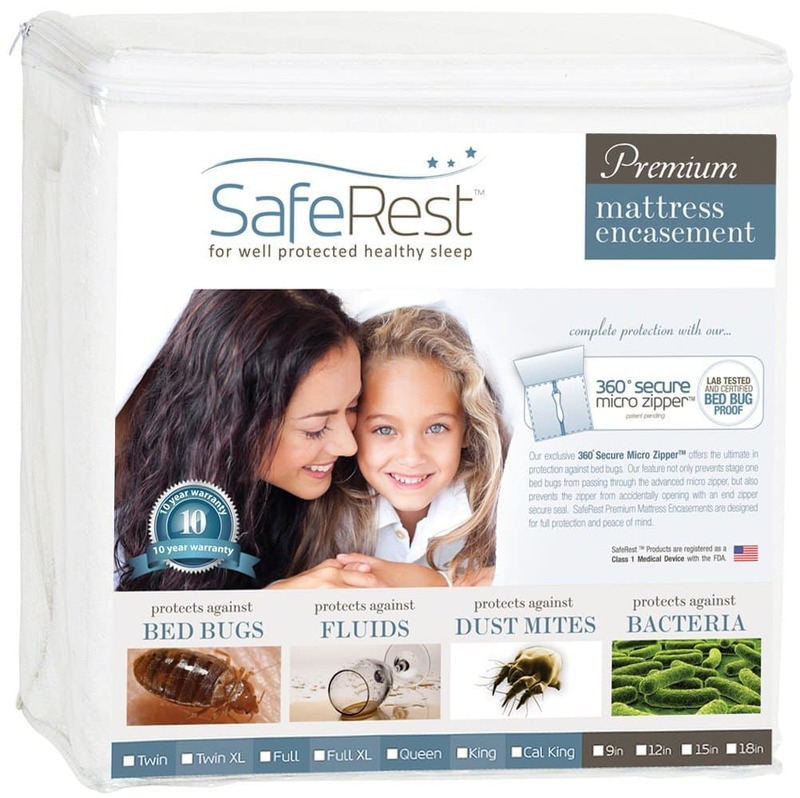 Our pick as the best bed bug mattress cover is the SafeRest. It gives us everything we were looking for on a budget we could afford. First of all, it’s the only cover on the list that has been independently certified to protect against bed bugs at all stages of their life cycle. This gives us plenty of confidence that the encasement really can help us solve a bed bug infestation without us having to toss our mattress. We also liked the superfine zipper teeth and seams. It gave us the 360-degree velcro closure we wanted. Bed bugs won’t be able to use small openings in the zipper to get out, and we won’t have to worry that the zipper accidentally opened, either. We trust it will stay in place throughout the year or for as long as the encasement remains on the bed. It’s quiet, something that was a must-have on our list. There’s barely any noise as we moved around, and the top felt like part of the mattress. One downside is that the material is a little big for most standard sized beds, but once you tuck everything in, it shouldn’t be an issue. For the price and the materials, it offers the best chance for you to get rid of your bed bugs without losing what you’ve invested in your mattress.